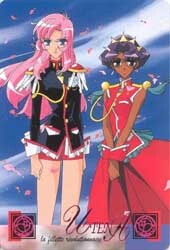 Utena Tenjou, a young woman who enters the exclusive Ohtori Academy, is like no woman you've ever seen. Blowing away any expectations you've come to expect, she carries dreams of her unknown past and one great wish: to be a protector. And she will soon learn that she will become more of a protector than she had ever imagined, beginning with the mysterious Rose Bride, Anthy Himemiya. A drama filled with strange mysteries and lots of shadow, Utena must now stand up against the truth about Ohtori Academy and about her mysterious past: truths that can literally change the world. A girl with a rose crested ring who doesn't really know her past finds out that she will become a dualist against the student council members of her school. The "Rose Bride" and her become good friends and her heart breaks when she has to give her up. A mystical prince who also has a shady past helps Utena through her battles against the student council members in the secret arena, he stays in the upside down castle on the ceiling of the arena. The above description came from Skitz, and was edited by yours truly (contact me).